Fate Reforged, the second set in the Khans of Tarkir block, is proving to be a tantalizing puzzle for folks interested in MTGFinance. The set introduces new mechanics, cards and themes which are difficult to evaluate without detailed deck testing. Further, the wide open nature and high power level of the current standard format means that incoming cards have a high bar to measure up to, and many possible interactions to consider. Fate Reforged also includes reprints of the KTK fetchlands, so their value will also weigh on all but the best of the cards in the set. Also worth considering is the fact that Fate Reforged will only be on the market for 6 weeks or so before Dragons of Tarkir previews start, opening up new opportunities and pitfalls for previously released cards, as well as reducing overall openings for Fate Reforged. This scenario almost certainly means that picking the few remaining cards that may break out as major players in the new standard or older formats is a potentially very profitable endeavor. Doing so however, is easier said than done, as one must identify the unsung heroes of the set, while simultaneously predicting that other players will come around to the same line of thinking through play testing and tournament results. The common theme here is “powerful cards that were underestimated at first”, with a splash (in Sidisi) of cards that just needed time to find their place in Standard. Treasure Cruise and Dig Through Time were w0idely insulted in the early days of KTK previews, as folks who hadn’t played with Delve before had trouble envisioning just how powerful mana-free casting costs really are. While others were insulting these cards in set reviews I was picking up Japanese foils by the dozen, a move that allowed me to double up within 2 months of release. Monastery Swiftspear was another widely unheralded card during preview season but it now stands shoulder to shoulder with Delver of Secrets and Goblin Guide as one of the best 1-drop threats ever printed. Japanese foils of this card were available overseas for as little as $8USD in September, and I sold my last set this week for $50/per. Siege Rhino was identified as being a central pillar of standard fairly early on, but when I started suggesting he was destined for Modern play in November based on some early Pod lists from key pros, plenty of people scoffed. Fast forward a few months and Rhino is a key component of the evolving Value (Birthing) Pod decks, and many pros have stated that it’s so good in Modern that it would likely survive the banning of Birthing Pod itself. I’ve been snatching up $10-15 foil copies of Siege Rhino, as I can easily see them hitting $30+ in a post-Treasure Cruise world in Modern. Sidisi, Brood Tyrant was on the back bench for the first half of the fall standard season as Jeskai Tempo, Abzan, Temur and Jeskai Ascendancy decks dominated the scene, but as the season continued, the grindy Whip of Erebos decks emerged as the value mongers of the format, and Sidisi, as a 4-of mythic, provided strong returns on the $2 low prices I was paying in late October. Note that the key with almost all of these cards was that they were cross-format all-stars, with most of them being played in at least 2 formats. Also, each card often appears as a 3 or 4-of, and only Sidisi is Legendary. Our goal then is to similarly identify the cards from Fate Reforged that are currently the most underrated and undervalued, and which have the best shot at crossing formats or at least achieving dominant positions in standard. 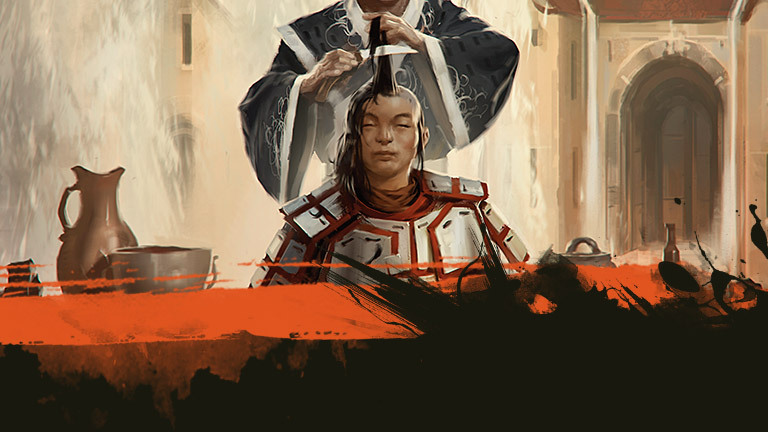 Humble Defector is my top pick for underrated cards in Fate Reforged. To my eyes, as an aggressive 2-drop that can easily be leveraged as a card drawing engine and combo enabler it is very likely to find a home in multiple formats as cards are noticed or released that enable his most broken possible turns. 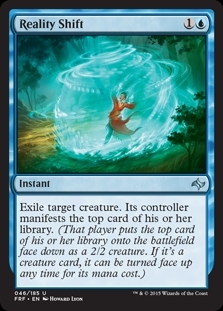 Many players seem to be getting hung up on the fact that this card can end up in the hands of an opponent, but focusing on this drawback largely misses the point of this card. You see, ideally, the deck that makes the best use of his ability will be built to ensure that he either a) doesn’t live long enough to let the opponent draw cards or b) steals him back. Regardless, with all the card draw, presumably nested within an Aggro, Combo or Burn shell, the opponent shouldn’t be around very long even in the worst case scenario. Of special note is how well Humble Defector combos with the utterly broken standard/modern/legacy combo piece Jeskai Ascendancy. With Ascendancy and Humble Defector in play and cantrips in hand, you have the potential to draw 4-8 cards in the same turn, ultimately bouncing (Retraction Helix) or sacrificing (Collateral Damage) Humble Defector after drawing your cards and possibly even attacking for 3-4 damage in lieu of his last card draw trigger. If that doesn’t peak your interest, nothing will. Note that even in situations where the opponent actually gets to use Humble Defector, you got your cards first, they aren’t likely to be set up like you are to abuse him, and they then have to give him back for you to further abuse. 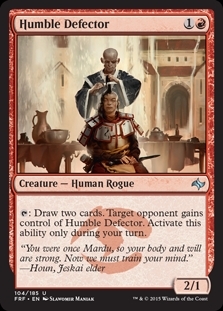 It’s also worth noting that Humble Defector is a great card to play politics with in EDH. Now as an uncommon, I’m much more interested in foils and foreign foils of this guy than I am regular copies, as I believe that it’s only a matter of time before he finds a home in a broken deck in the older formats. There are a few things people are missing with this card at first glance. Firstly, it generates GG at the start of both of your main phases (both before and after your combat phase), which is to say, this is a ramp spell that generates 4 mana per turn at the cost of 4 mana. Now it’s true that you don’t get all of the mana at the same time, but if you had 4 mana to put it into play, you now have 4 mana in each of your main phases, which means that in a green, deck you probably just ramped from 4 mana to 8 mana on turn 4, with the caveat that you can cast two 4-drops but not Ugin. If you have permanents that can make use of the extra mana, such as enchantments, equipment or pump effects, all the better. The 2nd mode on the card seems kind of narrow, until of course you realize that it combos with both Hornet Nest and Hornet Queen, in that the Hornets now act as Nekrataals when they hit the board. This card is commonly available under a $1 at present, and could hit $4-5 if it ends up being heavily played in Standard within the year. Foils are out there in the $3-5 range, and seem likely to achieve $10+ down the road. Humble Defector + Yasova Dragonclaw: Draw two and immediately steal it back from your opponent [on the attack] to draw two more. Humble Defector + Collateral Damage: Put the activated ability on the stack and sacrifice it in response. You get to draw 2 cards, and your opponent won’t get anything in return. 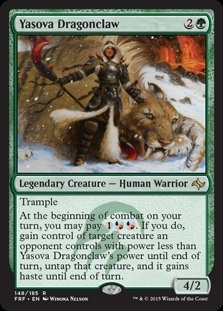 Yasova Dragonclaw + Collateral Damage: Attack your opponent with his own creature and then sacrifice it to kill another one of his creatures. All of that sounds good, but I still don’t expect Yasova to get there early in the season switchover. As such, she could drop as low as $1, at which point I’ll be looking to get in on a few playsets, if further reasons to play her have popped up, looking to exit around $3-4. This guy has been discussed plenty, but no one seems quite certain whether he’s the real deal. At $3 pre-order he may head lower before he heads higher, but he could also hit $6-7 if he makes it to an early top table as part of the reformulated Whip deck. The downside here is that he’s a Legendary creature, and as such, unlikely to be used as a 4-of. On the upside, he hits on a number of interesting angles, including low casting cost (due to Delve), the ability to fuel future graveyard/Delve cards later in the game, and his ability to rebuy your best cards, as manipulated by other Delve costs being paid. His single black casting cost and hybrid mana ability cost also means he could end up in decks we haven’t thought of yet, and in color combinations other than Sultai. 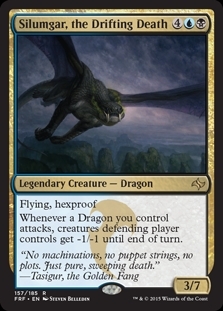 That’s a lot of power for a card that will often be cast for 2-3 mana and I suspect that we see Tasigur find a home as a 2-3 of in Whip decks and settle in the $4-5 range once folks move on to opening Dragons of Tarkir instead of Fate Reforged. There’s also a possibility people will want foils down the road for EDH or Legacy or Modern, as he’s likely big enough to tussle with the best, so tread that path as you will since they’re still under $10 at present. I totally missed this card on my first pass, outside of possible niche Legacy applications with Force of Will (as a card that can be exiled and provide future value). Then a few notable deck builders drew my attention to the fact that the card can also be exiled by Delve spells as part of their casting cost, and that a Whip/Delve/Tasigur deck is likely to be a thing in the very near future, based on early testing results. I’m still not completely sold, as I’m not sure this thing is ever going to be a 4-of, and could easily be pushed out of the resulting deck in favor of better metagame choices. Nevertheless, any “maybe” mythic available under $3 is worth a look because if it becomes a mainstay it could easily rise into the $8-10 range. One of the biggest problems with trying to pull off tricks with Manifest is that whatever you throw out there as a 2/2 is likely to be vulnerable until such time as you can flip it up. 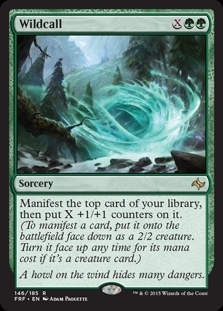 Now in standard it’s not clear that Manifest got enough support to “get there”, but in older formats many players are overlooking the potential to abuse your library with manipulation like Sensei’s Divining Top , Worldly Tutor, Ponder or Serum Visions, and manifest a Phyrexian Dreadnaught or Hooded Hydra for very little mana. A 12/12, flying, hexproof creature or a 5/5 flying, hexproof creature that leaves behind 5 1/1s is nothing to scoff at. As such I’ve been snagging these foils under $3 (maxing at 6 sets) on the assumption that someone is going to find a fun Tier 2 deck in an older format at some point that makes these a very solid value. One deck list I’ve been fooling around with mixes elements of Reanimator and Show&Tell with Cloudform, Brainstorm and Faithless Looting to ensure we’re sneaking something awesome into play on turn 2 or 3 one way or the other. If a Manifest deck makes it even to Tier 2 in Standard in the next 18 months, than the 50 copies of this rare card I’ve acquired for $.50 are going to look pretty smart. 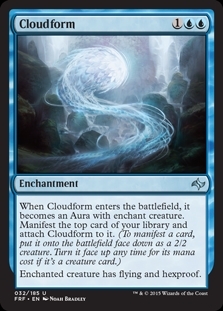 As with Cloudform, the potential is there for broken shenanigans in older formats as well, so I’m happy to sit on these for a while even if nothing develops in standard. The bottom line is that Wildcall always provides a creature of the size appropriate to the turn you draw it on, a subtle feature that should not be underestimated. Give it enough things worth manifesting and it just gets better, and it’s worth noting that placing counters on things is an added bonus that can be abused. Call me crazy, but this isn’t different enough from the banned Windfall template to make this unplayable. Sure, you get one less card, but you see X-1 additional cards for 3 mana, where X was your initial hand size, all while stocking your graveyard with exactly the things you wanted to get there. Think combo, delve, reanimator, etc. You may also disrupt your opponent, though you’re just as likely to fix their hand. Nevertheless, I suspect this card is breakable as a combo/enabler piece in older formats and with foils going for around $2 I’m happy to pick up a few sets. At the very least Nekusar decks will run this in EDH, giving your cheap foils a fine fallback position. As an uncommon with no likely prospects so far in Standard, steer clear on non-foils. This card is half Path to Exile and half Swan Song, and it’s almost certainly playable in Vintage and Legacy. It exiles a creature for 2 mana, which is twice as much as Path to Exile or Swords to Plowshares. 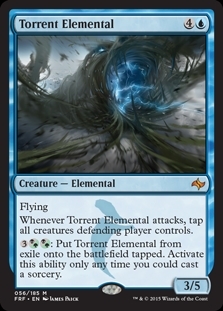 This must be balanced however against the fact that it’s in blue, the undisputed best color in eternal formats and the most frequent partner for burn spells. Being able to remove big threats easily while (probably) leaving a slow 2/2 clock on the board might actually be better than giving the opponent a land or some life, especially if you were sweeping, burning or otherwise ignoring their creatures anyway. It’s possible that the card even shows up in standard, since it answers most threats in the format easily and cheaply, and it’s drawback can be worked around in the air. StarCityGames.com quietly sold out of these at $2.99 and $3.99 during pre-orders, so if you can snag these in that range you should be in good shape for when they start popping up in powerful decks. This bad boy is hanging over the next phase of KTK Standard like a giant, nasty question mark. Is he an auto-include in Sultai whip decks? Will it be worth it to pair him with Chromanticore and live the dream? His current pre-sales at $2.50 and $5 for non-foils and foils respectively reflect curiosity present in the absence of certainty. Myself, I don’t think we’re dreaming big enough. In Standard you can get a 4/4 Flying, First Strike, Lifelink, Vigilence and Trample creature with Chromanticore, sure, but you could also just use Sagu Mauler to get Trample/Hexproof, or Siliumgar to get Hexproof/Flying which may be the better option in a format with tons of removal flying around. Reflect on the fact that in Legacy you can go: Swamp, 2x Dark Ritual, Emtomb Silumgar, Soulflayer and have your bad boy ready to party on turn 1 with very little chance of a valid response from your opponent beyond Force of Will. Start brainstorming decks that can dump 2-3 relevant creatures with the full mix of abilities into the graveyard early in the game and things really get nasty. In Standard I give this guy a 50/50 shot of hitting full potential and getting up to $6-8, but I think his foils actually have more upside as his combo partners are only going to get more numerous as time goes on, and could easily reach $30-40 with a top table result. I think both of these wild wyrms are being underestimated, especially given what’s likely to show up in a certain set called “Dragons of Tarkir”, coming our way in only a couple of months. Siliumgar, the Drifting Death, is likely a strict upgrade for UB control vs. Pearl Lake Ancient at a time where that deck is also gaining Reality Shift, Ugin and Crux of Fate. Hexproof and flying are a big game in the current standard, as is dodging the sweeper effect of Elspeth, Sun’s Champion and killing the myriad of expected tokens when you attack a la Doomwake Giant. He’s also a great blocker until you find your Crux and go on offense. He’s probably only a 1-2 of, and his ceiling is therefore likely around $4-5, but with a ton more dragons coming this spring, he can only get better. Atarka on the other hand is looking like a custom made finisher to pair with See The Unwritten and Stormbreath Dragon. In the current standard it’s not tough at all to cast STU on turn 4 off of Savage Knuckleblade for Ferocious and end up with a 6/4 Double Striking attacker to take the first kill spell while Stormbreath or Hornet Queen mops up. And that’s just with the tools we’ve already got. Like Silumgar, Atarka is pre-ordering for just $1.50 and I suspect it will slide to $1 once the floodgates open on online sales and I fully intend to grab at least 12 of each once we get there. 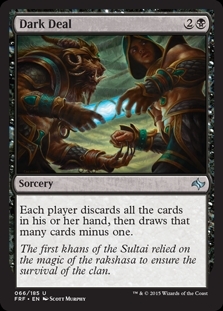 So there you have it, the long-shot specs of Fate Reforged. Which ones are you going after and why? Anything I missed that you think has a shot at a big rise? Dark Deal is nothing like Windfall, not because of the -1, but because you draw based on your handsize. With windfall, you play out your hand early, then draw based on your opponent’s handsize, then play out another hand. With Dark Deal, if you play out your hand, it does nothing. That’s true, but there are still plenty of applications for a card that dumps your hand to your graveyard. I think people are missing the simple interaction for humble defector and butcher of the horde! (maybe I missed people say it) I’ve been using Generator Servant to pump out hasty polukranoses and genesis hydras (which I hit either stormbreath or sarkhan). I think Defector could be the 2 drop single red draw engine that mardu midrange needs…or he simply eats the removal intended for goblin rabblemaster. Or he’s absolutely terrible and no one should buy him so I can scoop up his foils or only compete with you. Tasigur is ridiculous in limited and could be broken in Constructed. But he’s a regular rare and Fate is going to be drafted more than most second sets (correct? or is it still a “2” and Dragons is also going to be a “2”) based on the special draft format for Dragons and Fate. What is good “value” for his foil in your opinion? Re: Frontier Siege vs. Carpet of Flowers, they have to have Islands for Carpet, relegating it to the sideboard and only in decks that can use the extra mana. It can’t spawn an archtype for that reason. 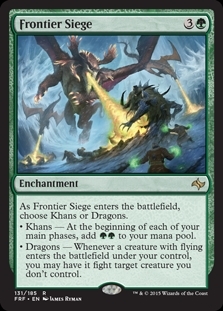 Frontier Siege on the other hand, played in your 1st main phase on turns 2 or 3 (we’re playing green remember? ), sets you back 2 mana that turn (since you can still play a 2 drop in your 2nd main), but puts you up 4 mana every turn thereafter, immediately ramping you to 6, but allowing for up to 8cc of spells to be played with just 4 lands/elves in play. That’s a ton of ramp and the reason why I think this card will eventually show up in a meaningful brew.